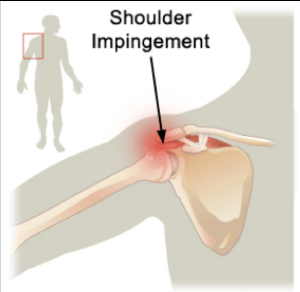 Shoulder impingement is a common and painful problem among athletes such as swimmers, sports that are throwing intensive, and volleyball (1). Shoulder impingement is closely related to shoulder instability (1). Individuals involved with overhead activities often have hypermobility and more laxity in the shoulder joint (1). Due to decreased space in the joint, the muscles of the shoulder and the bursa become impinged (1). These muscles include one of the rotator cuff muscles and the bicep tendon (1). Repetitive compression eventually leads to irritation and inflammation of the muscle tendons and bursa (1). Prolonged inflammation can lead to a decrease in muscle strength which could lead to a rupture of the bicep tendon or rotator cuff if gone unmanaged(1). Rotator cuff pain can cause swelling and tenderness in the front of the shoulder (2). There may be pain and stiffness when you lift your arm, or try to perform everyday activities like brushing your hair, putting on a shirt, or putting something on the top shelf. Pain can radiate from the front of the shoulder to the side of the arm (2). There is also sudden pain with lifting and reaching movements (2). Athletes will experience pain when throwing, serving a ball, swimming, etc. Example: A 32-year-old swimmer is experiencing pain and tenderness in the front of her shoulder. There is significant point of tenderness over her biceps tendon as well. She experiences discomfort with overhead activities, and has difficulty completing her workouts due to her shoulder feeling achy and weak. She also experiences stiffness in her shoulder after workouts or at the end of the day. The goal of the management plan is to decrease the pain and inflammation and restore normal range of motion and strength in the shoulder (1). Rest: Rest is a crucial part of the management plan. Let your body heal, and decrease your upper body physical activity temporarily. This will ensure the shoulder has time to heal and restore itself. Modifying your activity levels can make a difference. Ice: Icing your shoulder at least 3 times a day for about 20 minutes will help with the pain and inflammation in the shoulder joint. Over the counter drugs like ibuprofen (Advil) and naproxen (Aleve) will help reduce the pain and swelling. Seeking physical therapy will benefit you the most, by restoring range of motion and strength in the shoulder and preventing the problem from returning. If pain persists, it is recommended to see your doctor for further treatment. 2. Prentice, W. E. (2014). Principles of Athletic Training(15th ed.). New York, New York: McGraw-Hill Companies Inc.